Ohorongo CEM II B-V 42.5N Portland Fly Ash Cement is a dry powder blend of Ohorongo hydraulic portland cement and pozzolanic siliceous Fly Ash according to SANS 50197/NAMS 197. Stringent production control during the entire production process ensures consistent high quality. The Ohorongo Portland Cement clinker component is compliant to the SANS 50197 specification, whereas the fly ash mineral extender component complies to SANS 50450-1, category S.
The blend, Ohorongo Cement CEM II B-V 42.5N, complies to the SANS 50197 specification in terms of chemistry (B-V) and performance (class 42.5N). The “V” indicates siliceous fly ash of high quality and “B” represents 21%-35% of mass. Ohorongo CEM II B-V 42.5N Portland Fly Ash Cement blend is suitable for general concrete and precast concrete production. Ohorongo Cement CEM II B-V 42.5N is compatible with commercial chemical admixtures. 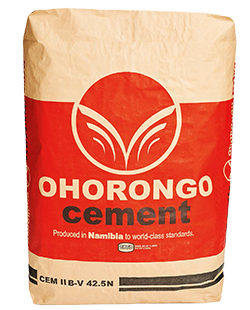 Ohorongo Cement is distributed in 50 kg bags, 2 ton bags and bulk tankers. Bulk storage silos should be dry and vapor tight. Cement bags should be protected from moisture and kept dry, preferably off ground by means of pallets or timber, preventing moisture contact. Bags should be stored away from direct sunlight, or should be covered by a roof or sheeting. Stacking should be kept to a maximum of two pallets high to avoid compaction of cement bags at the bottom. Refer to Ohorongo Cement Safety Data Sheet, obtainable from Ohorongo Cement. Ohorongo Cement offers technical support from its comprehensively equipped chemical-, cement-, and concrete laboratories. Assistance to cement- as well as concrete aspects, including advice on mix design is available from our qualified technical staff. Please contact the Ohorongo Cement Sales Office for price enquiries. If you are a redistibutor of Ohorongo Cement and need high resolution images for your promotional material, files in various formats may be found in the Ohorongo Cement Media Library. These are the Top Viewed Products.